ONE of the young Thai soccer players has described to a media conference in Thailand the dramatic moment the team heard their rescuers coming. Adul Sam-on, the only team member to speak English and who was able to communicate with the divers, told his teammates to be quiet when he heard the voices. "I started to listen and it became reality, the [talking]. I asked Mick to go down, because [he] was holding the torch. "Quickly, go down to have a look, otherwise they might go past us." 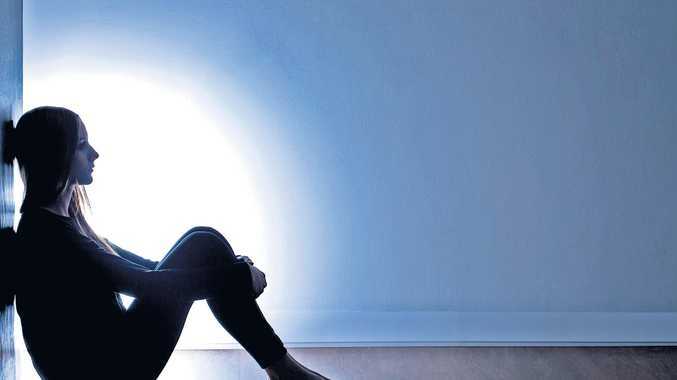 They answered questions submitted in advance and screened by psychologists to ensure their wellbeing, and walked into the government hall to cheers from a crowd outside. They had fresh haircuts and looked happy and healthy, despite their two week underground hell. The group smiled, waved and offered traditional "wai" greetings before telling of their relief when they were found by two British divers. Adul said the teammate hesitated, so he went and got the torch. "I greeted them, I said, 'Hello.' I heard, 'Hello.' Someone was raising their head above the water and said, 'Hello'. "When they came out of the water, I was surprised. I didn't know what to talk to them. "I said 'hello', or something like that. "When they said 'hello' to me, I said 'hello' back. It was so magnificent. I didn't know questions to ask. It took me a while before I could answer them, when they asked me how I was. I answered them, I was so surprised. The person asked me how many of us there were. I said '13'. … They answered, 'Brilliant,' and the person was very happy knowing there was 13 of us." Another boy said the group struggled to understand the dive team because their English was not good. "Everyone was so happy when they heard the noise of the divers. … It was the first noise from outside in 10 days. They asked me to go up, … go higher. They asked me how many days have we been in here and I answered him. … I said '10 days'. "At that time, my brain wasn't working. In my brain … there was no maths, no arithmetic, no English. At that time, I was so hungry as well." The coach, Ekkapol Chantawong, 25, said everyone agreed to go into the cave. He answered most of the questions, including how the nightmare began. "One of the boys said, 'Within one hour we have to come back, we have to come out before 5pm, because someone has to get home.'" When they went to leave, they realised they were trapped. Talk turned to who was the strongest swimmer so they could test how deep the water was. They then found more water and it confused them - they weren't sure if they were lost or not. In fact, was happening was the water had risen quickly and it was getting dark. "We were determined to find a way out. We tried to calm down. I told everyone to fight on, to have a good spirit, don't give up." They devised a plan to "dig a passageway" for the water to flow through - but it didn't recede at all. "Everyone decided, 'OK, let's go and find a place to sleep, don't worry, maybe it was just because the water rose and then it would recede later.'" "We had determined that we were going to spend the night there. We did not prepare any bedding materials at all." The initial plan was to remain near the water and to "pray to the gods", Mr Chantawong said. "At this time we were not afraid. I thought on the next day the water would recede and then someone would come and find us." Ekkapol Chantawong thought he and the team would be found the day after they became trapped. The hunger didn't really begin until the second day. By then, they were feeling weak. They tried to conserve energy, and not use the torch much as they were scared it would run out of batteries. The youngest team member told the media conference he felt "dizzy and weak" and tried to overcome this by not thinking about food. Asked what he had been thinking about, he said: "Fried rice and the dipping sauce of the north." He tried to drink water as much as possible. Much of the days were spent digging holes with stone pieces for something to do. They believed there was a way out at the end of the cave, but knew it was a long way away. "We have only one chance, to go to the other end of the cave," said the boy. "My opinion was - if we are not able it find that way out, then we will die in the middle. So, we came back. We had two choices … First, to go this way and the second is to wait there and let other people come to discover us. Water started to flow into our direction. After a while, within one hour, the water started to rise." To applause from a crowd watching, a team member told how all he wanted to do was "eat, eat, eat" and how he watched the final of the soccer World Cup. "Among us only two persons were supporting Croatia, the rest were supporting France. The team was very happy, because they were able to watch the final game of the World Cup." The boys walked into the conference in their Wild Boars soccer uniforms. They gestured thanks to the crowd who cheered them as they walked into the hall where the conference was held. They kicked a soccer ball around on a mock soccer field with teammates who weren't in the cave, before taking questions. Mr Chantawong said he would not go back to he cave without a guide. He vowed to be more careful in future with any sort of activity. One boy said he promised to be "a good person, a good citizen," while another said he would not live callously. "From now on I will live my life carefully." Several of the boys said they wanted to be Navy SEALs one day - an answer that drew applause from the crowd. Others wanted to be professional soccer players. The boys all had the same answer when they were asked what they would say to their parents. "I want to say sorry," one boy said, as the others agreed. Some of the boys hadn't even told their parents where they were going, and one had told his parents the wrong cave. Speaking in turns into a microphone and answering questions which had been supplied by the world's media, the boys appeared relaxed and calm. The most emotional part of the conference was when they paid tribute to former Thai Navy SEAL, Saman Gunan, who died while delivering them supplies. Before they left hospital the teammates posed for a photo while holding a picture of Mr Gunan. His death was the only one during the rescue effort that lasted two weeks and involved hundreds of people. In a further mark of respect, the boys' will enter the monkhood to pay tribute to Mr Saman. In Theravada Buddhist practice, ordaining to be a monk at a temple and donating the merit gained is one of the greatest honours that a person can give to another. When the boys are ordained, they will be doing so in honour of Mr Saman, and donating the merit of the exercise to his memory. 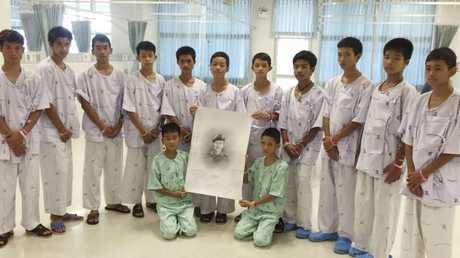 The rescued soccer team members posing with a sketch of the Thai Navy SEAL diver who died while trying to rescue them. Chiang Rai's provincial governor Prachon Pratsukan added that it would be their "only official media interview", saying that there would "be no more speaking with the press after this". The Wild Boars soccer team, made up of 12 children aged 11-16, and their coach Ekkapol Chantawong, were carried to safety in a high-risk rescue mission from the depths of the Tham Luang cave complex in northern Thailand over several days last week. Their heroic rescuers included the Thai Navy SEALs and foreign divers, including Australians, who risked their own lives in "completely uncharted, unprecedented territory" while racing against depleting oxygen and monsoonal storms, to bring the boys home. Thai cave boys make first public appearance: Thai cave boys speak about being trapped in a cave for two weeks.